Craving shrimp scampi, but watching your weight? Try my recipe for One Pot Zoodle Shrimp Scampi—this light dinner is sure to satisfy your scampi cravings. We love shrimp scampi in our house, but some nights I want a healthier lighter dinner. 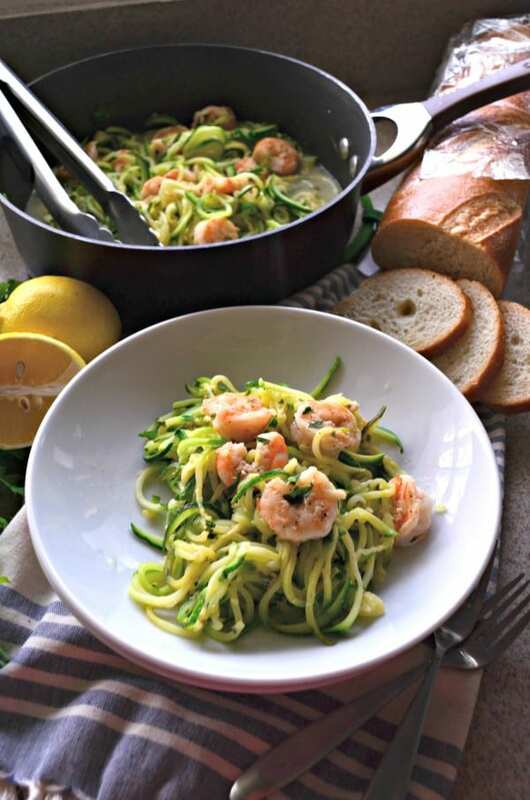 I’ve been making zucchini noodles like crazy lately and it hit me one day to mix our favorite shrimp scampi meal with zucchini noodles. Would you like to know what my trick is to keeping this a lighter meal? Lots and lots of fresh lemon! My husband was hesitant at first with this recipe, but after one bite he was in love, and actually asks for this meal on a regular basis. 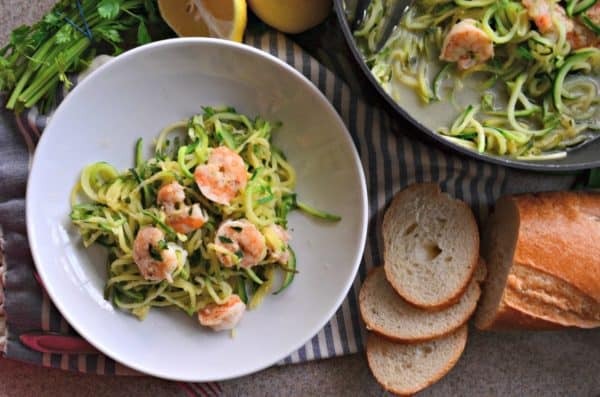 After we finished the one pot shrimp scampi with zucchini noodles (or zoodles as the hip people call them) it had us both wishing I doubled the recipe. At least with more zoodles. Because the zoodles are divine! 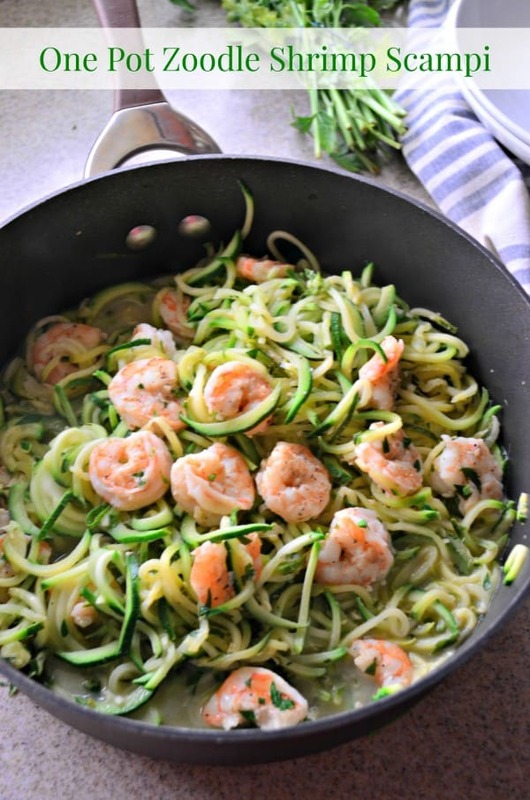 The key to making this one pot shrimp scampi with zucchini noodles is prepping everything prior to cooking. The entire meal takes only 4 minutes to cook. So it’s key to have everything prepped. 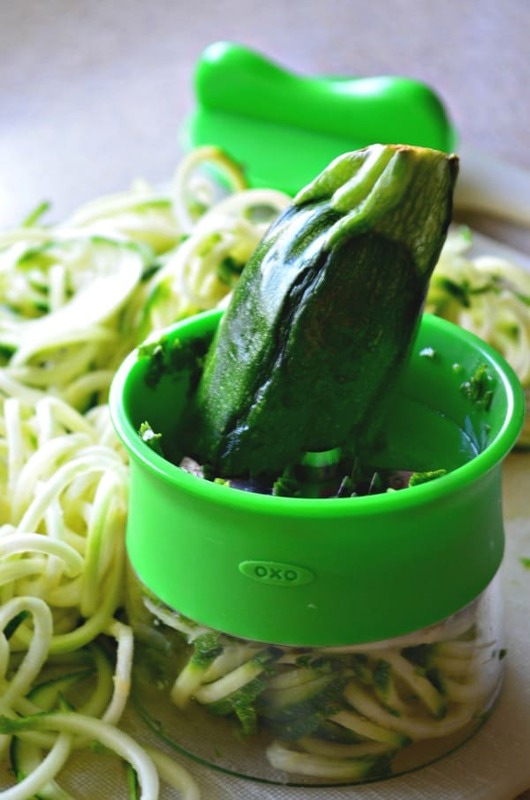 Depending on what device you have to make the zucchini noodles will depend on your prep time. I have the OXO Hand-Held Spiralizer so it takes a little longer verse the crank spiralizer or even the new KitchenAid Spiralizer Attachment. 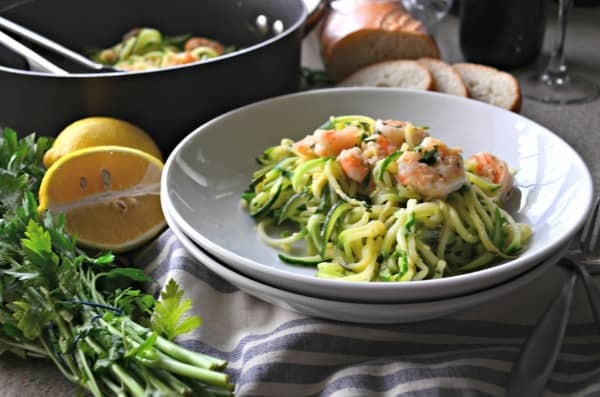 If your looking for a lighter version of shrimp scampi this recipe for One Pot Zoodle Shrimp Scampi is the ticket to allowing you to enjoy this guilty pleasure-like dish! Disclaimer: There are affiliate links in this post. That means if you click on the link and purchase I will receive a portion of the sale. This sounds delicious! Can’t wait to try it as soon as I get the handheld Oxo tool. They do make the best kitchen gadgets! Yes–so good! We had it for dinner last week! It’s a favorite in our house!